We have been up to our chins in raspberries since Saturday. 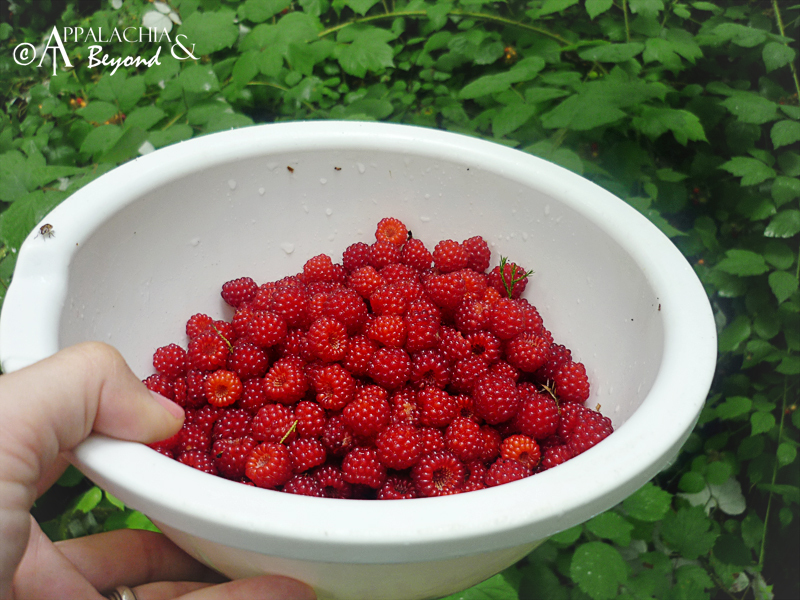 As you may have read, the raspberries were ready for picking, and they won't wait on you! So, we spent all weekend finding and picking ripe red raspberries on Flint Ridge. Saturday didn't go so well for the picking. 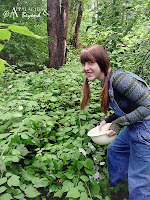 We had done work around the house, and by the time we made it to the patch, the mosquitoes had woke up. They were snacking on us big time, and we decided to give Sunday morning a try instead. 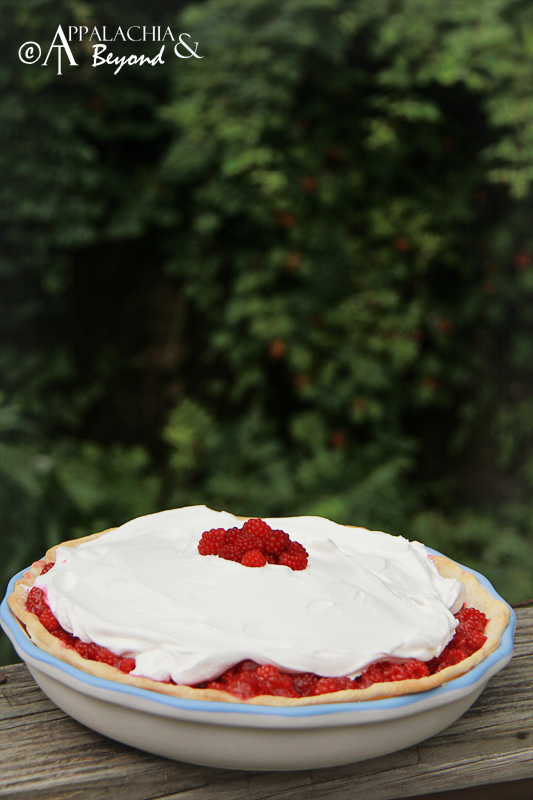 So Sunday morning we woke up early with a taste for fresh raspberry pie and jars just begging for jam, only to find it pouring the rain. And it rained and rained until well after noon. Once it slowed to a drizzle though, we put on our picking clothes and thought we'd outsmart the mosquitoes by dousing ourselves in Off! Deep Woods. But things just weren't going our way at all. Our Off! 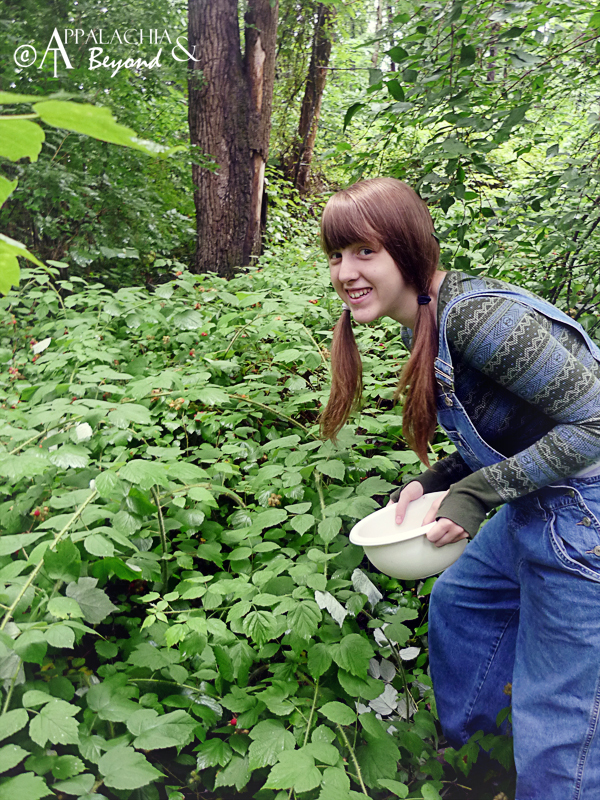 can had a tiny smidge left; enough to dust the bottoms of our britches to keep the ticks from crawling up our legs. Once again, we headed to the patch. This time we picked and picked and picked. All the while, the mosquitoes snacked and snacked and snacked. 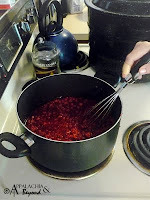 But we were determined to get enough berries to can and make at least one pie. 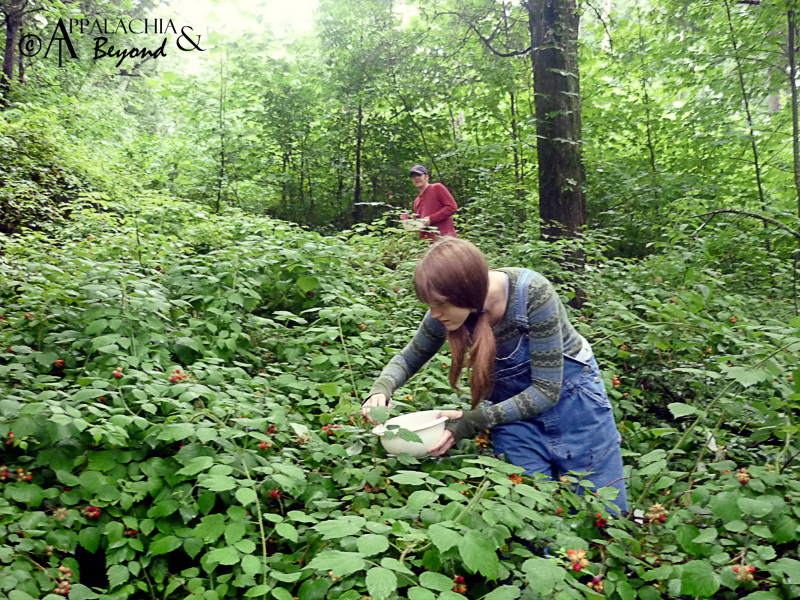 By early evening, we had picked enough berries to start the jamming process. You wouldn't believe it, but making jam is fun! It's a long process, but it's so worth it in the end. 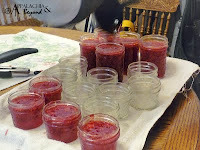 If you're interested in canning jam, you'll need a canner pot, a rack for it, some canning tongs, a funnel, lots of jars with lids and rings, a ton of sugar, some Sure-Jell (or your favorite pectin), and of course, some fruit. After mushing the berries, you add the Sure-Jell and sugar, boil, and add to sanitized jars. Follow the instructions that come with the pectin. It's a messy job, so be prepared to have sticky everywhere! Lastly, you process these in the water bath. There is nothing more satisfying than hearing the "pop, pop, pop" of the cans as they cool - the sign that they are properly sealing. In the end, we'd picked over 6 quarts of berries, which made 44 jars of jam - some 8 oz and some 4 oz jars. These will keep a year while sealed, and 3 weeks in the fridge when opened. And it tastes sooooo fresh! We picked another 2 quarts on Monday evening and had enough for a pie and some whole berries to send to my daddy (who's crazy about them). I know Tim is dying to eat this pie. It's been in the refrigerator overnight to chill, and surprisingly, there were no fingerprints in it this morning when I took it out for it's photo opp. It'll be the star of the show at tonight's supper gathering. Until next time! Happy Picking!